God brought His people over the Jordan River on dry land. By His power, He caused the waters to stop flowing at the point where Israel crossed over. It was a great miracle and blessing of advance for the lives of the people and their nation! So great was the moment that it needed to be remembered for all generations. While the river was dry, they took twelve stones from the river bed and set them up as a memorial to the day they crossed over the Jordan River. This was intended to remind the children, and future generations of the mighty hand of God. It was also intended as a witness to the all people that God’s power is a present reality. These stones were unlike any other because they came from an unseen place, the bottom of a river. 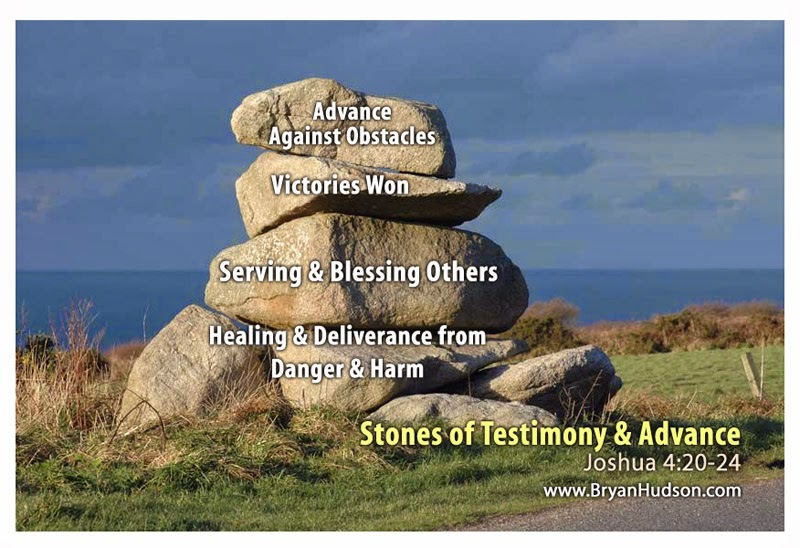 What “stones” of testimony and advance can we show and tell? What undeniable acts of God can you share? We need to educate our children and all people about the power and goodness of God! Through photos, media, good works, memorials and testimony, we need to share the goodness, love, and power of the Father God and the Lord Jesus Christ with clarity and boldness!